Ahoy Mateys!!! Come join us at the annual Henderson Winterfest Parade! This is a LIGHTS Christmas parade. So grab a glow necklace or some battery operated lights to adorn your garb and come walk with us!! This is an awesome event! It's a lot of fun to watch and even MORE fun to be IN IT!! The parade goes down Historic Water Street from Ocean to Lake Mead Parkway! Parade is Saturday, December 8, 2018 at 5 PM – 7 PM Best to meet us on Ocean by 4:30pm. We'll post our line up position as soon as we get it!! Come release your inner Pirate, mermaid, steampunk, faerie or rennie and have a blast!! Once again the streets of downtown will echo with "Ahoy!!" as the Pirates once again invade the Martin Luther King Jr. Parade! This is an awesome parade, not just one of the biggest in Las Vegas, but one of the largest in the country! We have been honored to participate in this parade since our inception in 2012!! The parade starts at 10am on Monday January 15th traveling up 4th Street from Gass to Ogden. We are unit #34 so watch for us!! Or if you are a pirate, grab your garb and join us!! Well the countdown is about to start!! You will probably see Pirate Fest on billboards, in ads and articles. As we get close, we will add TV. There is a LOT of local coverage coming.The next step for Pirate Fest is to start promoting OUTSIDE the Las Vegas area! Travel and Resorts is one of the major travel sites! This month they are featuring a article about Pirate Fest!! We can tell you what they have to say about us, but why?? Just link over and see for yourself...just like thousands of travels will!! ​ Click the Travel and Lodges logo below and read about Pirate Fest!! This month is Black History Month. One might ask, where there Black Pirates? That would be a huge YES! Pirate crews were one of the first truly integrated work environments. Pirates really cut across all ethic, socio and economic barriers. Many times pirates would raid some of the slaver ships. They freed the slaves and allowed them to join their crews! The crews of some of the most successful pirates, including Samuel Bellamy and Blackbeard, were largely made up of ex-slaves. Some of these slaves moved up the ranks becoming Captains themselves. One of the most famous Henri Caesar, also known as Black Caesar, (1791-1830) was a legendary Haitian revolutionary and pirate. The legend goes that he is one of the only pirates that didn’t spill his guts when captured. ​For nearly a decade, he raided shipping from the Florida Keys and later served as one of Captain Blackbeard’s chief lieutenants aboard the Queen Anne’s Revenge. He was one of the surviving members of Blackbeard’s crew following his death at the hands of Lieutenant Robert Maynard in 1718. Caesar’s Rock, one of three islands located north of Key Largo, was his original headquarters and the island is named in his honor. Black Caesar assisted in the removal of slave holders alongside L’Ouverture and his followers during the Haitian revolution. Caesar and his men took over a Spanish ship moored offshore, and thus became pirates in the Caribbean. As things became increasingly dangerous in his native waters off Haiti, Caesar took off for the Florida Keys. Guild Applications are now available. Go to the GUILD PAGE, download the application. Fill it out and email it back or use the Medieval Method and snail mail it to us! Guild Page has info and contact numbers if you have questions. There will be limited number of Guild accepted. Good news is there is limited overnight camping for the Guilds at the new Craig Ranch location!! Be one of the first!! Apply today!! The pirates did a Mannequin Challenge at the Henderson Christmas Parade. While the entire crew is frozen in time...ol Two Hits the drunken pirate is oblivious to what is happening! Watch as he wanders through the crew, poking and waving at the "statues" wondering..."is this real? Or am I hallucinating?? I need a better grade of RUM!!!" Go to our Facebook page CLICK HERE you can see the entire video, then LIKE it and share it with your friends!!! By the way remember we took SECOND PLACE in the Henderson Lighted Christmas Parade, in our FIRST APPEARANCE!!! Pirate Fest is happy to announce that we are teaming up with the Las Vegas Track Club and their Celebrate Education team to present the first Pirate Fest 8k and 1 mile Pirate Fun Run at Pirate Fest this April. We are working out details but tenatively the Run will be Sunday morning April 23. The race will take place just before the opening of Pirate Fest so the runners will just end their race as the festival opens!! Pirate Fest has always been an activity oriented festival. You can't get more activity that to grab the family and do a 1 mile Fun Run!! ​Keep checking here and our Facebook page as details are worked out!!! 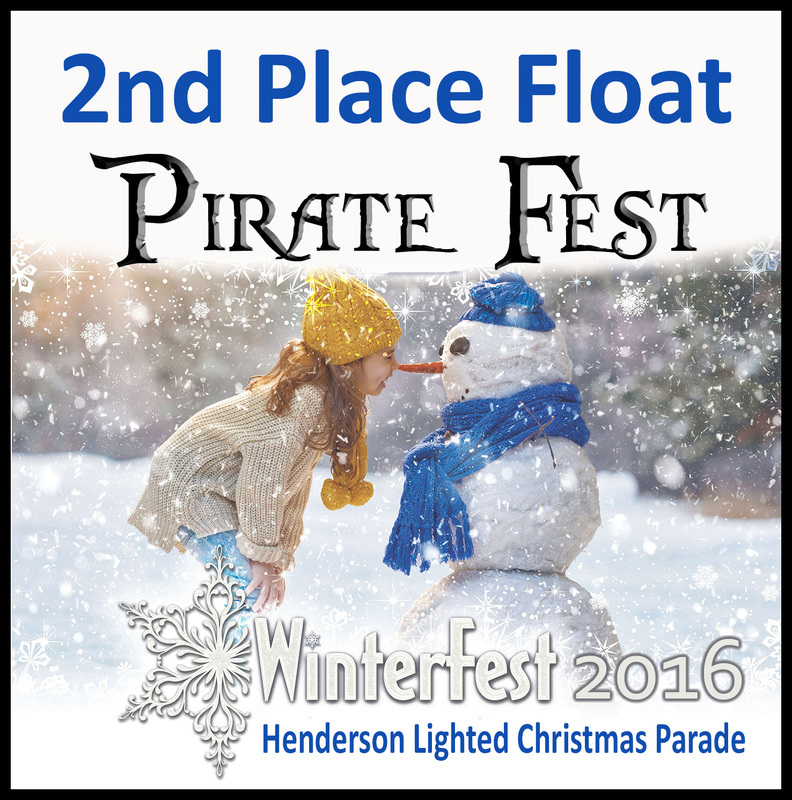 December 10th we participated in our FIRST Henderson WinterFest Parade. It is a lighted Christmas parade. So we covered the Pirate Boat ride with lights, Moe Lastfogel covered his new Steampunk/Pirate/Train with lights, Jesus Silver covered his boat with lights.....even Capt. Justin Kase and his daughter Captsized Kate were covered with lights!!! Out of the almost 70 entries...PIRATE FEST won 2nd Place Float!!! Henderson did an awesome job on this parade! It was a LOT of fun for all of us! Looks like we have a new annual parade to participate in! ​Thanks to EVERYONE who came out, we'll have to pull out the stops next year to defend our title!! !